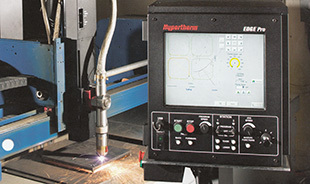 The Edge Pro CNC Builds on more than 40 years of Hypertherm's experience in the cutting industry. Designed to be flexible and easy to use, the EDGE Pro delivers reliable performance for the improved profitability. Using Phoenix software, this CNC improves cut quality and productivity by delivering our expertise directly to your factory, making it as if you have your best operator on every shift.